Egyptians highly regarded onions and believed that because of their spherical shape and concentric rings symbolized eternal life. The Egyptians also used onions as currency to pay the workers who built the pyramids. Onions were placed in tombs of kings such as Tutankhamen so that they could carry these gifts with spiritual meaning with them into the afterlife. Many eyes tear because of their pungency but they tickle your taste buds. The onion, known scientifically as Allium cepa, is, on the surface, a humble brown, white or red, paper-thin skinned bulb. Despite its plain looks, it has an intense flavour and is a well liked and important part of every cuisine around the world. Onions range in size, colour and taste depending upon their variety. There are generally two types of large, globe-shaped onions, classified as spring/summer or storage onions. The former class includes those that are grown in warm weather climates and have characteristic mild or sweet tastes. Included in this group are the Vidalia onion and the Walla Walla onion. Storage onions are grown in colder weather climates and, after harvesting, are dried out for a period of several months, attaining dry, crisp skins. They generally have a more pungent flavour and are usually named by their colour: white, yellow or red. Spanish onions fall into this classification. In addition to these large onions, there are also smaller varieties such as the green onion, or scallion, and the pearl onion. Milk isn’t the only food that boosts bone health. Onions also help maintain healthy bones, suggests a study published in the Journal of Agricultural and Food Chemistry. Onions may be especially beneficial for women, who are at increased risk for osteoporosis as they go through menopause. Several anti-inflammatory agents in onions are also beneficial for reducing the severity of symptoms associated with inflammatory conditions such as the pain and swelling of arthritis, the allergic inflammatory response of asthma, and the respiratory congestion associated with the common cold. The onions anti-inflammatory effects are due not only to their vitamin C but to a substance called quercitin. This compound works to relieve inflammation and in addition, quercitin and other flavonoids found in onions work with vitamin C to help kill harmful bacteria, making onions an especially good addition to soups and stews during cold and flu season. When selecting fresh onions in the store, look for onions that are firm and dry with a shiny, crackling outer skin. Look for ones that are clean and have no opening at the neck. Be aware of excessively strong odours because this might indicate rotting. Fresh whole onions should have a mild odour. Avoid onions that are sprouting or have signs of mold. Avoid onions that have dark spots as this can indicate mold. Sweet onions are best used fresh because they do not keep well. To get the best flavour out of sweet onions, purchase and use them within a day or two. When purchasing scallions or green onions, look for those that have green, fresh-looking tops that appear crisp, yet tender. The base should be whitish in colour for two or three inches. Avoid those that have wilted or yellowed tops. Onions need to be stored at room temperature, away from bright light, and in a cool, airy place. To do this, either place them in a wire hanging basket or a perforated bowl with a raised base so that air can circulate underneath. The length of storage varies with the type of onion. Those that are more pungent in flavour, such as yellow onions, can stay longer than those with a sweeter taste, such as white onions. Green onions or scallions should be stored in a plastic bag in the refrigerator where they will keep for about one week. All onions should be stored away from potatoes, as they will absorb their moisture and ethylene gas, causing them to spoil quickly. Left over cut onions should be wrapped tightly in plastic or in a sealed container and should be used within a day or two since they tend to oxidize and lose their nutrient content quickly. Cooked onions will best maintain their taste in an airtight container where they can be kept for a few days; they should never be placed in a metal storage container as this may cause them to discolour. Onion lovers know that while they enjoy eating onions, the cutting process will bring a tear or two to their eyes. The compound that causes the eyes to burn is a phytonutrient known as allyl sulfate that is produced when sulfur-compounds released by the onion’s ruptured cells are exposed to air. If cutting onions irritates your eyes, there are a few tricks that you can employ. Chill the onions for an hour or so before cutting. This will slow the activity of the enzyme that produces the allyl sulfate. Use a very sharp knife and always cut the onions while standing; that way your eyes will be as far away as possible. If cutting onions really makes you cry, consider wearing glasses or goggles. Mix up chopped onions, tomatoes, avocado and jalapeno pepper for an all-in-one guacamole salsa dip. To perk up plain rice, sprinkle some green onions, also known as scallions, and sesame seeds on top. Add sautéed chopped onions to any vegetable dish to jazz them up. Enjoy a classic Italian salad which is made up of sliced onions red onions, tomatoes and mozzarella cheese drizzled with olive oil and sprinkled with freshly chopped basil. There are two categories of dry onions: storage onions and sweet onions. Storage onions are low in water and high in sulfur, so they store well and are available year-round. Sweet onions are usually available just from April to August. Storage onions are more pungent and flavorful than sweet onions, and they’re best if cooked before eating. Sweet onions are usually served raw or lightly cooked. Boiler Onions: Boiler onions are available all year round and are usually uniform in shape. They are medium sized with a clear skin that is free of bruises or blemishes. They are firm and range in colour from white, yellow and red. Avoid boiler onions that are too big or ones that are soft and moldy. Boiler onions are versatile and used in casseroles, soups stews, roasted or creamed. Green Onions: The green onion is also called a spring onion. The green leafy part of the green onion is the main part to be used in cooking. The sharp-sweet, aromatic flavour of the leaves is especially appreciated in Russian cooking, where they are used raw in various salads or as delicious filling in pies. The white part is used like ordinary onion. Green onions can be replaced with scallions. Green onions are the oldest and most used ingredient in Chinese cooking. Pearl Onions: These onions are small, round and about the size of a marble. They are covered with white, red or golden papery skin. Gold, Red and White pearl onions are available all year round. Look for pearl onions that are firm with dry, papery scales and small necks. Store pearl onions in a well ventilated bag, basket, or crate in a cool, dark place. Pearl onions will keep about 1 month. To skin pearl onions, drop them in boiling water. Cook for 1 minute. Drain pearl onions and run under cold water. Punch the root end. The skin will slip off. Pearl onions are perfect for stews and dished cooked en papillote (in parchment paper). Red Onions: Red onions are known as Italian sweet onions. They are great in salads, topped on hamburgers and other dishes where colour and a sweeter taste are important. Red onions can also be cooked, grilled or roasted. Red onions are higher in antioxidants since it contains the same antioxidant that blueberries have. So get more bang for your nutritional buck and use red onions. 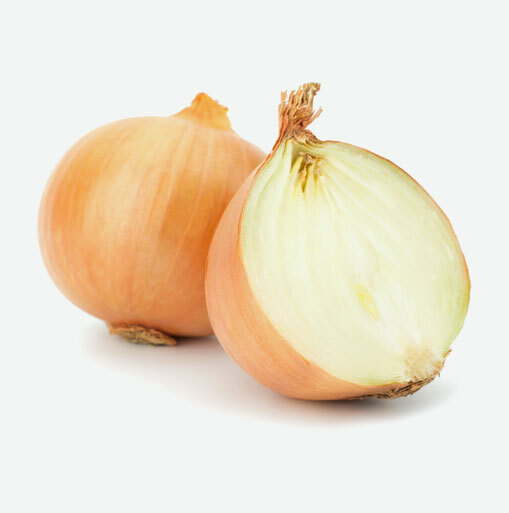 Spanish Onions: Spanish onions are large mild and succulent. They are often eaten raw but are great cooked. Spanish onions are great topped on hamburgers or tossed into a salad. These onions are delicious when making French onion soup. Spanish onions are also delicious when used in classic Mexican cuisine. Spanish onions come in three colours; yellow, red and white. Sweet Onions: The sweet onion is a variety of onion that is not pungent. There are several varieties of sweet onion. Although all onions contain sugar, sweet onions have a very low sulfur content as compared to typical onions and they have a very high water content. This difference in balance between the water and sulfur is what creates the sweetness of this onion. White Onions: White onions are a type of dry onion that has a pure white skin and sweet, mild flesh. This onion is used in Mexican cuisine and for complementing the flavours of other ingredients. White onions can be sautéed to a dark brown colour and served to provide a sweet and sour flavor to other foods. Vidalia Onions: Vidalia onions are the most well-known onion in the sweet onion varieties. Vidalias were first grown in Toombs County, Georgia, but it first came to Georgia from Texas. The city of Vidalia was the site of a Farmer’s Market since it was located at the junction of several heavily-traveled highways. The sweet Vidalia onion got its name after this hub city. Vidalia onions are a light golden-brown bulb with a white interior, rounded at the bottom and somewhat flat on the top stem end.